Christmas is my favorite holiday and I just love the smells of Christmas! 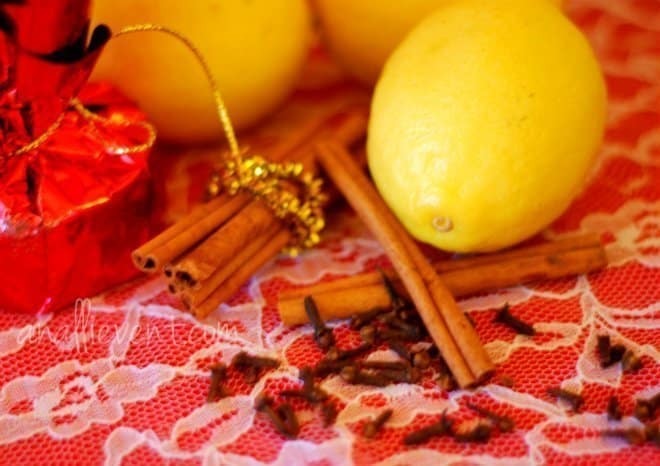 I especially love that smell of cinnamon, cloves and citrus. And I always want the smells of Christmas to waft through my house, permeating every nook and cranny. Candles or plug-ins could do the trick. But my husband can sniff out those chemically prepared concoctions as soon as he walks through the door. He is, shall I say, sensitive to them. But this? It’s the perfect antidote for both of us! Plus, it’s all natural, no chemicals involved. Happy Smells! Place all ingredients in a saucepan. Bring to a boil, then lower the heat and simmer. Add water as needed. I do have all these ingredients and am about to put this on! This along with a nice Christmas CD will keep me in the spirit today as I decorate the house! I pinned it too! Thanks, Shirley! You are always so giving and so, so sweet. So glad we’re blogger friends!! I love to have my house smelling great during the winter when it’s always closed up. I’ll have to try your recipe to make it smell great.